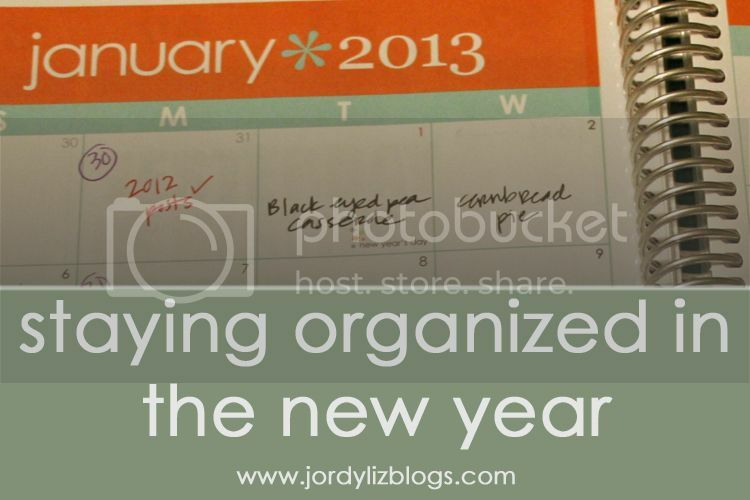 Jordy Liz Blogs: How we're staying organized in the new year. How we're staying organized in the new year. It's no secret that I'm slightly obsessed with anything involving organization, a calendar, or color coding. Even with just the two of us right now, our weeks fill up with things to do and places to be, and everything post-workday seems to get lost in the mix. I've tried all sorts of ways to keep us organized and I think I can finally say I've found our niche. I have a detailed calendar through my Erin Condren planner. The trouble is, Chris doesn't have access to it most of the day. To keep him in the loop, I tried the Cozi application for a while and really liked it. However, it required Chris to sign on each time he needed to check our schedule if there was something he was planning. Little did I know the answer was in our very hands the whole time. We now use the calendar through our iPhones to sync our schedules. 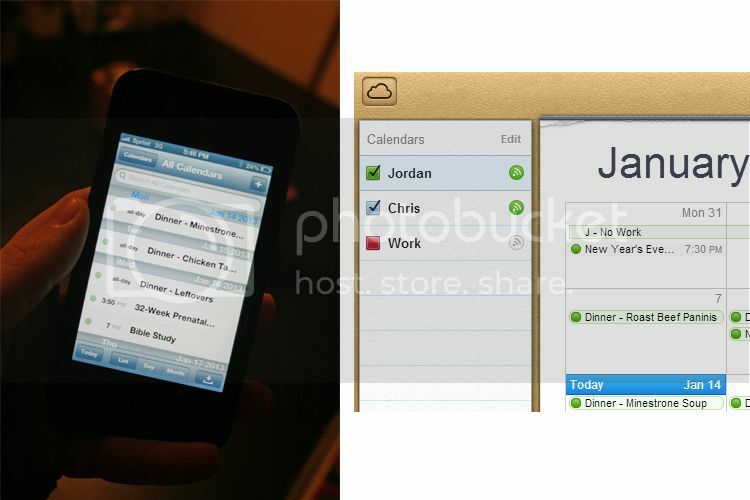 Turns out, if you log onto icloud.com, add a user to your calendar view, you're synced! I can add plans from my phone and Chris will get an alert right then and there. And he can do the same to alert me. Long gone are the text messages that read, "Do we have plans on..." or "Are we doing anything tonight?" Check your phone, buddy. It's all there. I'm still in love with my Erin Condren planner and have a shiny new one for this new year. She updated the monthly calendar spreads to cover two pages, which gives me a lot more room to use the monthly planning calendar. In the past, I skipped over it because it was just too small. Now, I use up every inch. I have found it perfect for meal planning and blogging. In red, I have blog posts I am planning on for the month. A check mark means it is scheduled and ready to go. It's a great visual to see what's coming up. In black, I have our dinner plans. I plan all of our meals out before we go grocery shopping. This has saved us a ton on our grocery bill and makes the weeknights seem much easier. 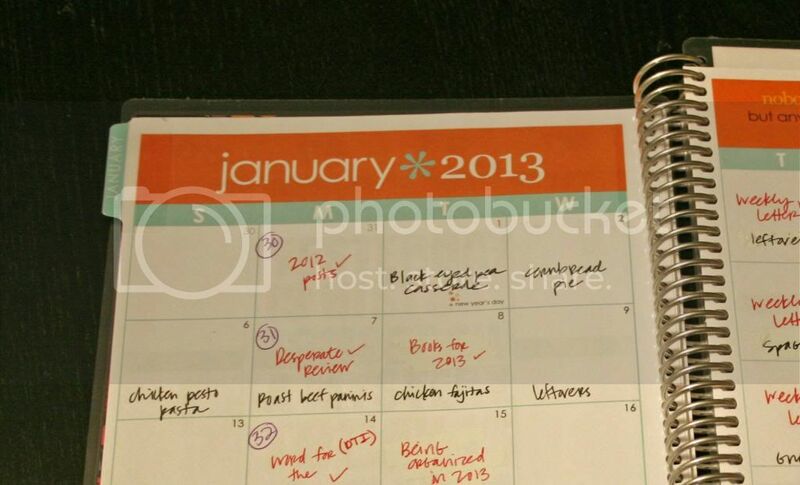 Simultaneously, I use this meal planner from my sweet friend Casey to sort out grocery needs. I also add our dinner plans to the iPhone calendar because I was secretly tired of answering, "What's for dinner?" It's planned and posted. We have quite a few family members and friends to buy for throughout the year. Between birthdays and Christmas for almost 20 family members and several close friends on top of that, we needed a way to keep our gift-giving in check. I tend to buy gifts ahead of time if I happen to stumble upon the perfect gift and/or a great deal. Not only does this spread out the expenses so we aren't dropping hundreds of dollars all in December for Christmas or rushing out to buy that last-minute birthday gift, but it also makes our list much more manageable. I keep all of the gifts in a hall closet with a list on the inside of the door to keep me in check. It is organized by date, then person, then occasion. There is a spot to fill in what I purchased for them, and then a space to check off if I am done purchasing everything for the gift. Then, I can just shop from the closet! No make-up or getting dressed required. I can also keep this list for next year to refer to as I start the gift-giving all over again. (Is it just me, or do you always forget what you got someone the year before?) You can read more about that here. And just for you, here's a free download for you to make your own gift list. How do you keep your family's schedule organized? thanks for the mention! thrilled you love your planner! enjoy!